Check your refrigerator and freezer, 12 million pounds of beef have been recalled due to potential salmonella. A massive ground beef recall was issued in October by the nation's largest beef processor, JBS USA. Now it has gotten even bigger. The U.S. Department of Agriculture reports an additional 5.1 million-plus pounds have been recalled in addition the 6.9 million pounds recalled two months ago, for risk of contamination with salmonella newport, a strain of the bacteria that is a common cause of food poisoning. The total 12.1 million pounds of raw beef products, including ground beef, were produced between July 26 and Sept. 7 by JBS USA at its JBS Tolleson, Inc., processing plant in Tolleson, Arizona. The products have been distributed nationwide and include the brands Kroger, Cedar River Farms, Grass Run Farms and JBS generic. As of November 15, 246 people to become sick in 25 states, according to the US Centers for Disease Control and Prevention. No deaths have been reported, but 56 people have been hospitalized. In California specifically, 66 people have been reported ill. It's being advised to "only consume ground beef that has been cooked to a temperature of 160°F. Other cuts of beef should be cooked to a temperature of 145°F and allowed to rest for at least 3 minutes," by the USDA. Symptoms of salmonella usually begin within 12 to 72 hours of consuming contaminated food. These can include diarrhea, abdominal cramps, and fever that last between four and seven days. Most people recover on their own, but those who experience persistent diarrhea may need to be hospitalized. Click here for the list of recalled items and product labels. I tired that vegetarian stuff years ago and I had the shits for 6 months straight. 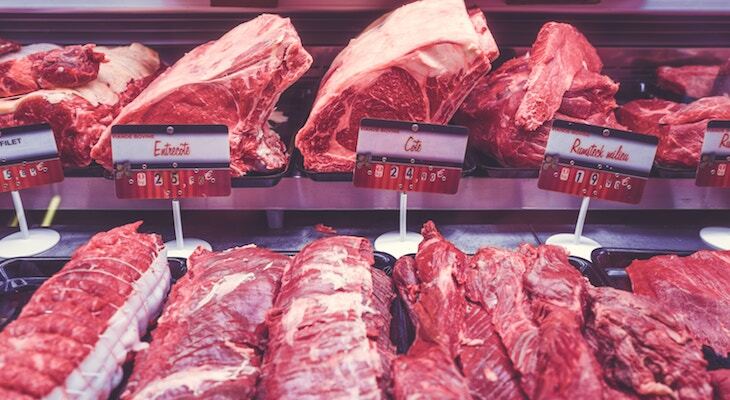 WHY is anyone still eating meat? It's time to EVOLVE and only eat cruelty free things that are good for your body and our planet. Ugh. "Evolve?" Really, nothing is worse than a smug veggie-doofus, except one with E. Coli hahahaha! Go graze some lettuce. Good for your body as in...Romaine topped with E. coli? So much for that Steak and Caesar Salad combo! "The total 12.1 million pounds of raw beef products, including ground beef, were produced ..." ________________________________________________________________________________ I scanned the recall list; only thing on it that's not ground beef is some chicken patties. Vegetarians eat Romaine lettuce. A few years ago it was spinach being recalled. Not too unusual for non-meat food to have e-coli. When it pays to be vegetarian. It ALWAYS is good to be vegetarian. First our romaine and now our beef?? ?